George Duning's melodic gifts were essential to his two-decade run as Columbia Pictures' lead dramatic composer (Picnic, The Devil at 4 O'Clock) and subsequent, prominent work for television (Star Trek, The Big Valley). FSM continues its presentation of Duning's best scores with two delightful comedy-fantasies: Bell, Book and Candle (1958) and 1001 Arabian Nights (1959), paired from the Colpix Records stereo masters. Bell, Book and Candle was a popular comedy starring Jimmy Stewart and Kim Novak in a sly take on contemporary Manhattan witchcraft: Novak is a lonely witch, and Stewart her romantic target, with supporting turns by Jack Lemmon and Ernie Kovacs. Based on a play by John Van Druten, the film was a change of pace for Stewart and Novak, whose other film that year featured a very different type of romance (Hitchcock's Vertigo). Bell, Book and Candle was one of George Duning's favorite projects, allowing him to exercise his gift for melody, romance, and jazz (in several source cues featuring The Candoli Brothers on trumpet). Duning was always at his best with romantic elements, and the film's fantasy aspects allowed him to extend his musical imagination into colorful depictions of witchcraft. 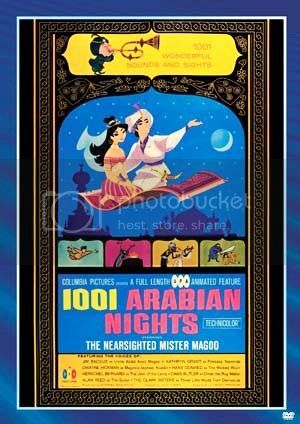 1001 Arabian Nights was an animated feature film starring Mr. Magoo (voice of Jim Backus), here "Abdul Azziz Magoo," the uncle to Aladdin, as in "Aladdin and the magic lamp." The film was animated and produced by UPA Pictures, and received a splendid, colorful score by Duning, who wrote three songs with lyricist Ned Washington: "Magoo's Blues," "You Are My Dream" and "Three Little Maids From Damascus." Duning enlisted several "ethnic" musicians to depict the Middle Eastern locale, incorporating them into a traditional symphonic setting. Despite the fact that it was written for animation, the album (presenting the film's lengthier cues and musical setpieces) has little "mickey mousing" and sounds like it could be the score to a live-action fantasy film. FSM's premiere CD of these two soundtracks comes from the Colpix Records album masters. 1001 Arabian Nights was released in stereo in 1959; Bell, Book and Candle, however, was only issued in mono in 1958, and did not premiere in stereo until a 1980 Citadel LP reissue. FSM has gone back to the three-track Colpix stereo album masters for the best-ever presentation of this classic score, including the "bonus track" (here correctly titled and placed as track 9) from the Citadel reissue. New liner notes by Daniel Champion are presented along with the original LP commentaries. Thanks to their recent Halloween sale I finally picked FSM's Bell, Book and Candle and just heard it for the first time. Marvellous ! A tuneful and lovely music in every aspect; well worth anyone's attention. Seeing there's no comment on this CD so far, I'm happy to make the first one. I love that Score - it's so jazzy Hollywood. When I was 12 years old, I went to see it during the Christmas Holidays and sat through it all day long. I think I saw it 4x that day. If you check out my Avatar on the left, you'll notice that I have a weakness for James Stewart-Kim Novak movies from 1958. No, you can't. How coincidental that the greatest Film ever made (IMO) also has the greatest Film Score ever composed (IMO). No argument here. Still kinda curious about Bell Book and Candle, Jimmy and Kim made a good couple in Vertigo. Bell, Book and Candle is a wonderful score - and the film is highly entertaining, too. I prefer the score to Vertigo - which ranks high on my list of favourite scores - but, for viewing, I prefer the other film. I don't have many scores by George Duning but I enjoy all those that I do have (and, of course, 3:10 To Yuma is a masterpiece). The animated film 1001 ARABIAN NIGHTS is now available as a made-on-demand DVD from the Sony/Columbia Choice Collection. I'm not letting a Duning get away from ME now that it is on sale! I'm quite surprised that you don't have it by now, David. "Bell, Book and Candle" is a genuine classic - must have played it hundreds of times! Get it by all means!!! I love this album. I don't really care for Arabian Nights, but "Bell Book & Candle" must be in my top 50 scores ever. I did a custom Pro Tools edit in which ditched the godawful "Jingle Bells" in the main title. It goes directly from percussion, to the ascending string line, to the main melody. Absolutely seamless, and it is now a perfect album.